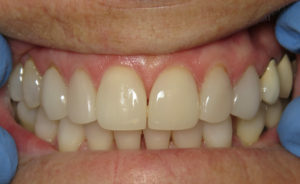 Porcelain veneers on average last 15 years but there are a number of variables. If the risk of caries is low and you generally have healthy teeth then they can last a long time. If you clench or grind your teeth then the risk of breaking your natural teeth and other restorations can be high. If you have bad habits such as biting your nails or using your teeth to tear open packages then veneers might not be a good choice for you. 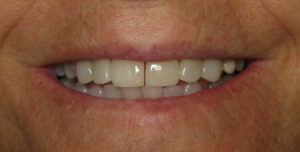 Over the years I have restored many teeth with porcelain veneers and I always design them with maximum longevity in mind. It is prudent to make sure the bite is balanced. A bad bite can cause teeth and restorations to wear down and cause the muscles and jaw joint to become sore. Just recently I had 2 long time patients in for their checkups. They each had some cosmetic dentistry done by me over 15 years ago and their smiles look fantastic still. 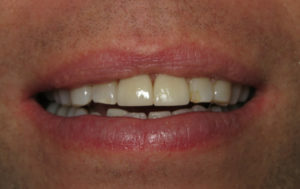 The first case is 6 porcelain veneers from 2002 and the second case is 2 porcelain crowns from 2003.